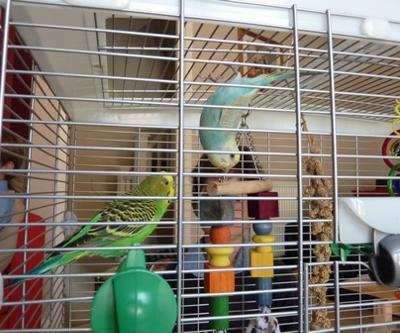 I bought these budgies for one of my children - he'd originally asked for a Golden Eagle and I negotiated him down! This photo is from the first day we had them (we are only on day 3) and Rainbow soon demonstrated her love of hanging upside down. They are happy, noisy, lively little things and I wonder why I didn't have them before! Rainbow, one half of Rainbow and Sparkles above, escaped. Long story, but she was out of the house and out of sight at about 10.30am. 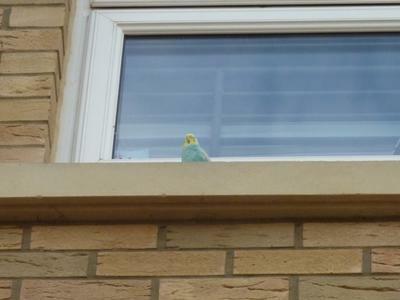 I downloaded and played budgie calls out the window, put Sparkles in the doorway and he shouted away for her, but she got chased off by house martins. We did all the stuff - put flyers through letterboxes and knocked on doors, but I'd given up. Then at about 6pm my daughter saw her appear in the back garden in amongst a flock of sparrows! Amazingly she was still flying and hadn't collapsed somewhere. I guess it was all the free-flying in the room that I encouraged them to do. 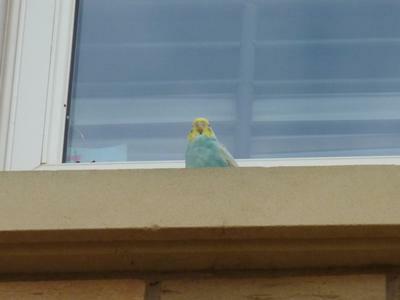 She then hopped onto a window ledge and after a while in through the balcony door and onto the cage where Sparkles was yelling his beak off for her. I never thought we'd see her again, and yet through lots of hard work we got her back. Happy? You bet! 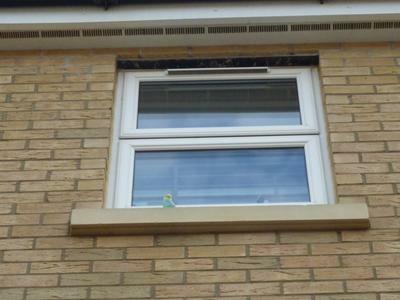 Here's some photos of her sitting on the window ledge just before she flew back in.